The launch was originally planned for March 15, 2007 but postponed due to damage from a hail storm on February 26, 2007. Following the hailstorm at KSC on February 26, 2007, inspections of the stack found damage to the shuttle and the external tank. Hailstones as large as golf balls had created around 1,000-2,000 divots in the tank's foam insulation, damaged at least one Ice Frost Ramp on the tank, and caused minor surface damage to about 26 heat shield tiles on Atlantis's left wing. On March 04, 2007 the STS-117 stack was similarly rolled back into the VAB. Following additional inspections, repairs to the orbiter and tank were carried out to return Atlantis to flight readiness. 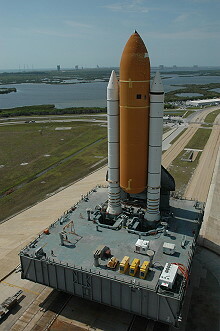 After completion of the repairs, Atlantis (along with her distinctly speckled external tank) was rolled out to pad 39-A for the second time during the morning of May 15, 2007. The hail damage to Atlantis caused major changes to the shuttle launch manifest at that time, pushing STS-118 back to August 08, 2007 (which could not have flown until the installation of the S3/S4 truss segment carried by Atlantis was completed), STS-120 back to October 23, 2007, and Atlantis's return on STS-122 back to a targeted launch date on December 06, 2007. Atlantis on STS-122 eventually lifted off on February 07, 2008. 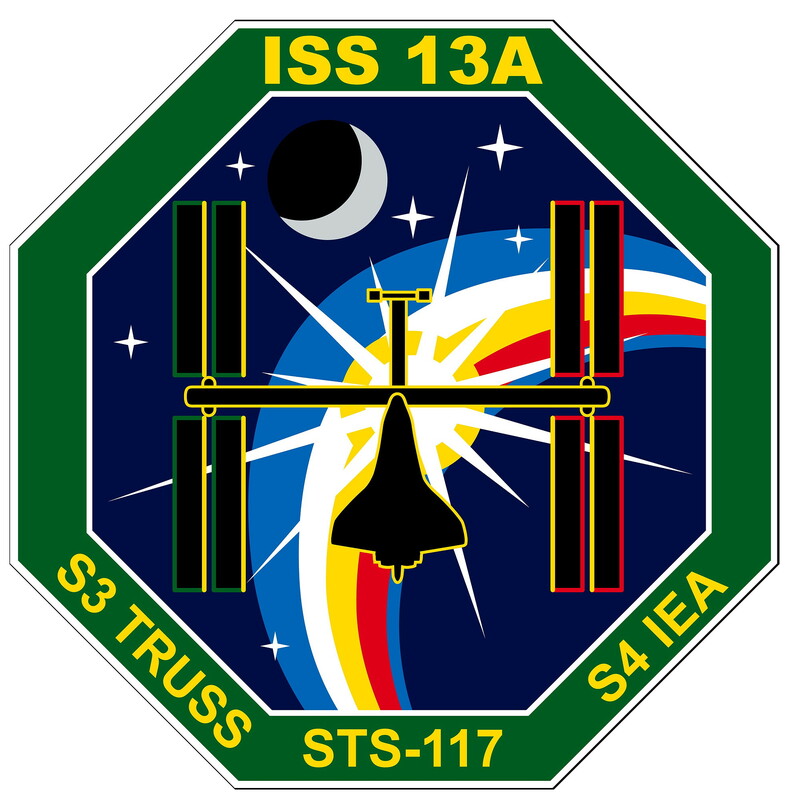 STS-117 (ISS-13A ITS-S3 / ITS-S4) delivered to the International Space Station (ISS) the second starboard truss segment (the S3/S4 Truss) and its associated energy systems, including a set of solar arrays. During the course of the mission the crew installed the new truss segment, retracted one set of solar arrays, and unfolded the new set on the starboard side of the station. After several months working aboard the station, NASA astronaut Sunita Williams will return to Earth aboard Atlantis. 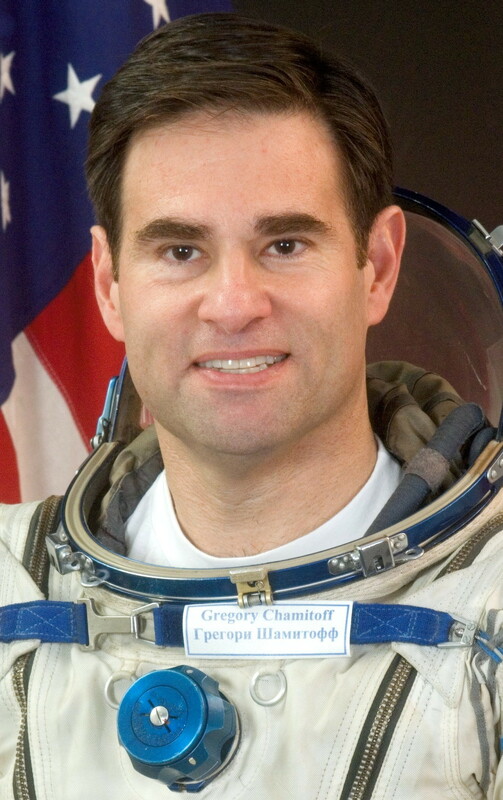 The flight will also carry her successor, astronaut Clayton Anderson, who arrived on Atlantis to begin his duty as an Expedition 15 Flight Engineer. 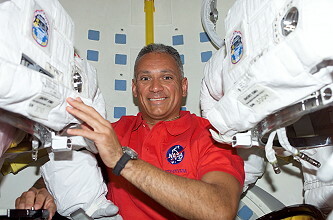 The exchange of Clayton Anderson and Sunita Williams was originally planned for the STS-118 mission, for launch in August 2007. However, that flight, first set to fly in June, had to be postponed after an unexpected hail storm damaged Atlantis' external fuel tank and delayed STS-117. 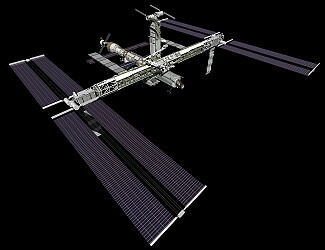 With the new plan, Sunita Williams' mission on the station had approximately the same length as originally anticipated. Sunita Williams launched to the station December 09, 2006, aboard the space shuttle Discovery as part of the STS-116 mission. The mission delivered and installed the 17.5-ton S3/S4 truss segment to the starboard side of the integrated truss system of the orbital outpost. The truss, part of the station's girder-like backbone, is a mirror image of the P3/P4 truss installed during STS-115 in September 2006. The new truss segment includes a set of photo-voltaic solar arrays. When unfurled, the 240-foot (73.2 meters) arrays provide additional power for the station in preparation for the delivery of international science modules during the next two years. Each of the 82 active array blankets that are grouped into 31.5 "bays" contains 16,400 silicon photovoltaic cells to convert sunlight into electricity. The truss also contains a Solar Alpha Rotary Joint (SARJ), which will rotate 360 degrees, clockwise or counterclockwise, to position the S4 and S6 solar arrays to track the sun. Processes to activate the SARJ were modified after STS-115. During that mission, difficulties were encountered with software associated with the gears within the joint, and spacewalking astronauts had trouble loosening bolts during its structural preparation. Software to control the SARJ was updated, and the spacewalkers now will carry another tool, called a torque multiplier, to help remove any balky launch restraints. The mission included the retraction of the starboard solar array, known as 2B, on the P6 truss atop the station, which would otherwise interfere with the rotation of the new starboard arrays. 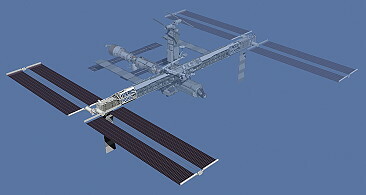 The retraction also prepared the P6 truss for its relocation to the outboard port side of the station later in 2007. Retraction began a day earlier than originally planned because of the tricky retraction of the P6 port side solar array during the STS-116 mission in December 2006. Atlantis' spacewalk teams were also prepared to assist the retraction. The Starboard Three (S3) and Starboard Four (S4) integrated truss segments are the primary payload delivered on the STS-117 mission and the heaviest space station payload to date. The principal functions of the S3 and S4 truss segments are to provide electrical power and data interfaces for future mission payloads and convert sunlight to electricity. The segments will include another set of Solar Array Wings (SAWs) and a second Solar Alpha Rotary Joint (SARJ). The integrated truss segments started with Starboard zero (S0) as the center assignment and were numbered in ascending order out-ward to the port and starboard sides. Starboard is the right side and port is the left side of the truss structure. Z is zenith and is up. From S0, the truss segments are P1, P3, P4, P5 and P6 and S1, S3, S4, S5 and S6. P6 is on orbit and attached to segment Z1 (zenith). The zenith is a spacer added to provide adequate space between the pressurized modules and P6. P6 eventually will be relocated and attached to P5. Plans for S2 and P2 segments were eliminated when the station design was scaled back. The S3 primary structure is made of a hexagonal-shaped aluminum structure and includes four bulkheads and six longerons, beams that connect the bulkheads. The secondary structure includes brackets, fittings, attach platforms, extravehicular activity equipment and miscellaneous mechanisms. The major S3 subsystems include the SARJ, Segment-to-Segment Attach System (SSAS) and Payload Attach System (PAS). The S3 truss segment will provide mechanical, power and data interfaces to payloads attached to the four PAS platforms; axial indexing for solar tracking via the SARJ; translation and work site accommodations for the Mobile Transporter; accommodations for ammonia servicing of the out-board PV modules and two Multiplexer/Demultiplexers (MDMs). The MDMs are basically computers that tell other electrical components when to turn on and off and monitor hardware. The S3 also provides a passive attachment point to the S1 segment via the SSAS and pass through of power and data to and from the outboard segments. The SARJ continuously rotates to keep the SAW on S4 and S6 (S6 launched on shuttle mission STS-119) oriented toward the sun as the station orbits the Earth. Each SAW is also oriented by the BGA, which can change the pitch of the wing. Each wing measures 115 feet by 38 feet (35.1 by 11.6 meters) and extends out to each side of the Integrated Equipment Assembly. There are two wings on S4. Major subsystems of the S4 truss are the port inboard Photovoltaic Module (PVM), the Photo-voltaic Radiator (PVR), the Alpha Joint Interface Structure (AJIS) and the Modified Rocketdyne Truss Attachment System (MRTAS). The S4 PVM includes all equipment outboard of the SARJ outboard bulkhead, namely the two Photovoltaic Array Assemblies (PVAAs) and the Integrated Equipment Assembly (IEA). The PVR provides thermal cooling for the IEA. The AJIS provides the structural transition between S3 and S4. Each PVAA consists of a SAW and BGA. S4 also contains the passive side of the MRTAS that will provide the structural attachment for the S5 truss. During its first full day in orbit, crewmembers aboard Atlantis inspected the shuttle's heat shield. The crew was given an extra half-hour to sleep after being kept up late to finish downloading in-cabin video. Pilot Lee Archambault and Mission Specialists Patrick Forrester and Steven Swanson used the shuttle's robotic arm and orbiter boom sensor system (OBSS) to inspect the heat shield on Atlantis wing leading edges and nose cap. 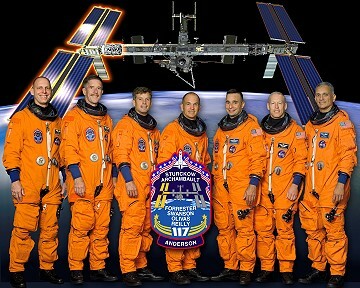 Based on lessons learned during the previous three post-Columbia missions, during STS-117, the crew used new inspection procedures devised by NASA. The scans took less time, covered a larger area and they used a camera on the end of the OBSS to take close-up photographs at the same time the laser scanner was collecting data. The astronauts started with the starboard wing leading edge, making multiple passes up and down the wing to cover all the angles. After scanning the nose cap, they moved on to the port wing and repeated the procedure. The shuttle launch was timed precisely to place the orbiter on the correct trajectory and course for its two-day chase of the station. Periodic engine firings gradually brought Atlantis to about 50,000 feet (15,240 meters) behind the station - the starting point for a final approach. About 2.5 hours before docking, Atlantis' jets were fired during what is called the Terminal Initiation burn to begin the final phase of the rendezvous. Atlantis closed the final miles to the station during the next orbit. 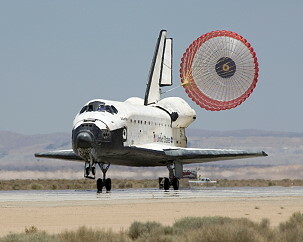 As Atlantis moved closer to the station, the shuttle's rendezvous radar system and trajectory control sensor tracked the complex and provide range and closing rate data to the crew. During the final approach, Atlantis executed several small mid-course correction burns that placed Atlantis about 1,000 feet (304.8 meters) directly below the station. 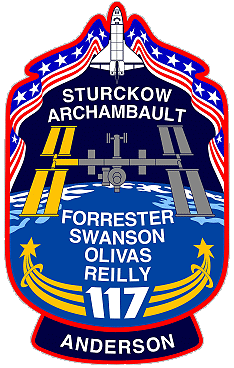 STS-117 Commander Frederick Sturckow then manually controlled the shuttle for the remainder of the approach and docking. He stopped the approach 600 feet (182.9 meters) beneath the station to ensure proper lighting for imagery prior to initiating the standard R-bar Pitch Maneuver (RPM), or backflip. Frederick Sturckow maneuvered Atlantis through a 9 minute, 360-degree backflip that allowed the station crew to take as many as 300 digital pictures of the shuttle's heat shield. On verbal cue from Pilot Lee Archambault to the station crew, Frederick Sturckow commanded Atlantis to begin a nose-forward, three-quarter of a degree per second rotational backflip. The photos were taken out of windows in the Zvezda Service Module with Kodak DCS 760 digital cameras outfitted with 400 mm and 800 mm lenses. 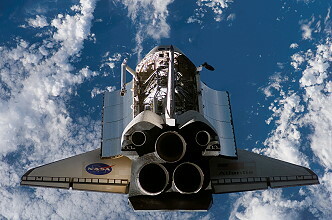 The imagery was one of several inspection techniques to determine the health of the shuttle's thermal protection system, including the tiles and reinforced carbon-carbon wing leading edges and nosecap. The photos were downlinked through the station's Ku-band communications system for analysis by systems engineers and mission managers. When Atlantis completed its rotation, its payload bay was facing the station. Frederick Sturckow then moved Atlantis to a position about 400 feet (121.9 meters) directly in front of the station in preparation for the final approach to docking to the Destiny docking port. 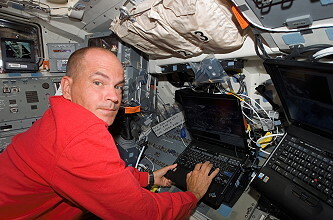 The shuttle's crew members operated laptop computers processing the navigational data, the laser range systems and Atlantis' docking mechanism. Using a view from a camera mounted in the center of the Orbiter Docking System, Frederick Sturckow precisely matched up the docking ports of the two spacecraft. If necessary, he paused 30 feet (9.14 meters) from the station to ensure proper alignment of the docking mechanisms. 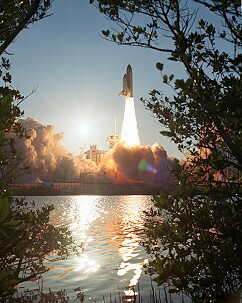 For Atlantis' docking on June 10, 2007, Frederick Sturckow maintained the shuttle's speed relative to the station at about one-tenth of a foot per second (3 centimeters per second) (while both Atlantis and the station were traveling at about 17,500 mph = 28,163 km/h), and kept the docking mechanisms aligned to within a tolerance of three inches (7.6 centimeters). When Atlantis made contact with the station, preliminary latches automatically attached the two spacecraft. Immediately after Atlantis docked, the shuttle's steering jets were deactivated to reduce the forces acting at the docking interface. Shock absorber springs in the docking mechanism dampened any relative motion between the shuttle and the station. 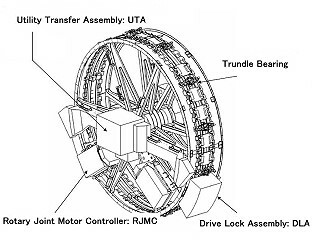 Once the motion between the spacecraft had stopped, the docking ring was retracted to close a final set of latches between the two vehicles. When Atlantis arrived at the station two days after launch, the Expedition 15 Commander Fyodor Yurchikhin and Flight Engineers Oleg Kotov and Sunita Williams greeted the six-person shuttle crew. Fyodor Yurchikhin and Oleg Kotov arrived at the complex April 09, 2007 following their April 07, 2007 launch on the Russian Soyuz TMA-10 from the Baikonur Cosmodrome in Kazakhstan. 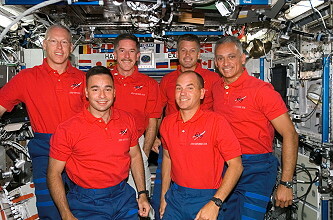 They returned to Earth in October 2007 after the arrival of the next station crew. Sunita Williams came to the station on Discovery's STS-116 flight in December 2006. 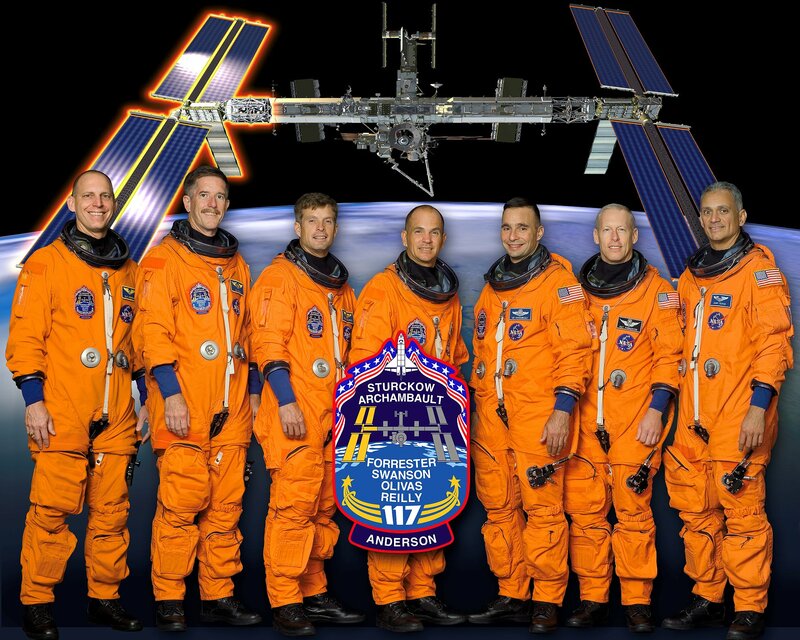 She returned at the end of STS-117 onboard Atlantis. Following docking, Pilot Lee Archambault and Mission Specialist Patrick Forrester used the shuttle's Canadarm to grapple the S3/S4 truss, lift it from its berth in the payload bay, and maneuvered it for handover to the station's Canadarm2. 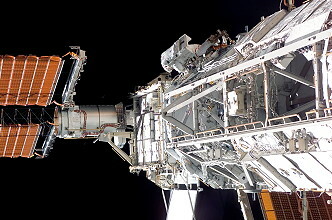 After hatch opening, Sunita Williams used the Canadarm2 to take the truss from the shuttles robotic arm. That task was completed at 00:28 UTC marking the completion of the handover. The truss remained grappled to the stations arm until next day's installation. The first EVA was performed by James Reilly and John Olivas on June 11, 2007 (6h 15m). After venturing out of the Quest airlock into space, Mission Specialists James Reilly and John Olivas released launch restraints on the four Solar Array Blanket Boxes, which house the folded solar arrays. They made final attachment of bolts, cables and connectors, and began preparations for the activation of the truss. The two spacewalkers rotated the array canisters into their normal position for deployment on the next day. The start of the spacewalk was delayed for about an hour after the station temporarily lost attitude control when the station's control moment gyroscopes (CMGs) went offline. The spacewalk started after station's gyroscopes were initialized by flight controllers. NASA's Mission Management Team also decided to extend Atlantis' mission by two days and to add a fourth spacewalk. John Shannon, the head of NASA's STS-117 Mission Management Team during the day's mission briefing told reporters that the extra time would give the crew to complete the ISS assembly tasks and allow ground engineers to draw up plans to repair the damaged blanket on the OMS pod of Atlantis. The successful deployment of the S3/S4 solar arrays was the highlight of the flight day 5, adding significantly to the ISS power generation capabilities. Prior to crew wake up, station controllers began unfurling the solar array attached to the S3/S4 truss segment. Shuttle crew then took over, unfolding one wing at a time in stages, pausing to let the sun warm the solar array panels which helped to prevent the thin individual panels from sticking together. The crew finished unfolding the first wing at 16:29 UTC and the second at 17:58 UTC. 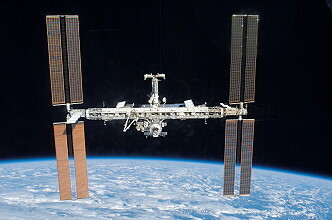 There were continuing problems with the station's electrically-driven gyroscopes, the preferred, non-propulsive, method for controlling the ISS due to a problem with a Russian navigation computer. The navigation computer problem started when flight controllers attempted to turn attitude control over to the ISS computers after letting shuttle computers handle it while the arrays were unfolded. The navigation computer would not allow them to do so, and forced a reboot of the main Russian command and control computer. The forced reboot triggered an alarm enunciating the problem to the crew and ground controllers. The issues appeared to have been resolved by the end of the day and the station's gyroscopes took over attitude control shortly after 08 pm CDT. That was followed by relocation of the Mobile Transporter in preparation ahead the next day's spacewalk. The crew or shuttle/station combined stack never was in danger throughout the troubleshooting efforts. The second EVA by Patrick Forrester and Steven Swanson occurred on June 13, 2007 (7h 16m). The main task of the spacewalk was to prepare the Solar Alpha Rotary Joint (SARJ) between the S3 and S4 Truss segments for rotation. After exiting Quest at 18:03 UTC the two spacewalkers moved up the P6 Truss to monitor the retraction of the 2B Solar Array and to assist if required. Patrick Forrester, was in a foot restraint on the station's Canadarm2, and Steven Swanson had specially-prepared tools to use to help the panels of photovoltaic cells fold properly. Flight controllers were able to get seven and a half of the 31.5 solar array bays folded. Then, Patrick Forrester and Steven Swanson were able to poke and prod another five and a half bays worth of panels into folding correctly (some 45 feet = 13.7 meters) before moving on to the SARJ. 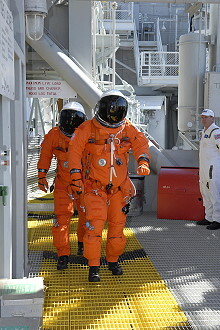 Patrick Forrester and Steven Swanson completed EVA 2 with mixed results. The duo removed all of the launch locks holding the SARJ in place. The spacewalkers had planned to remove the SARJ's launch restraints as well, but ran into problem when Patrick Forrester tried to install a drive-lock assembly. They discovered that the S3/S4 SARJ motor control circuits were wired in reverse. As such commands being sent to the drive-lock assembly were actually being received by a drive-lock assembly that was installed during EVA 1. So one launch lock restraint was left in place to prevent the possibility of undesired rotation. After the end of the spacewalk problems became serious when navigation computers in the Russian segment did not operate. Over the next days, the computers were repaired. Meanwhile Mission Control had decided to extend the mission duration. The solar array blanket atop the P6 truss was furled to a little more than half its original length by the Atlantis and the station crews. Commander Frederick Sturckow, along with Pilot Lee Archambault, Mission Specialist Sunita Williams and Flight Engineer Clayton Anderson, meticulously retracted the solar array blanket another three bays worth of panels. The crew carefully sent commands to retract the array as much as possible ahead of EVA 3. By last count, 15 and a half of the 31 and half bays remained to be folded into a 20-inch-deep (51 centimeters) protective box. The third EVA by James Reilly and John Olivas was conducted on June 15, 2007 (7h 58m). While John Olivas anchored to the end of Atlantis' robot arm was repairing the OMS pod, James Reilly installed an external hydrogen vent for the oxygen generating system inside Destiny laboratory. By using his helmet camera, John Olivas beamed down close-up views of the torn insulation and surrounding blankets to help flight controllers assess the system's condition. John Olivas spent two hours stapling and pinning down a thermal blanket on the OMS pod. Flight controllers from Houston also radioed James Reilly that they had decided to have him disconnect the P-12 connector that was installed during EVA 1 since the Russian flight controllers were planning to make an attempt to restart the problematic computers in the ISS. Even though the connector was not in use at that time, engineers decided to have James Reilly disconnect it to make sure that it was not causing any electrical noise or grounding issues that might have played a role in the computer trouble. When those tasks were completed, the two astronauts along with their colleagues inside the shuttle and station and flight controllers in Houston completed the final retraction of the starboard P6 truss element. The retraction that required 28 commands was completed and latches closed. The successful folding paved the way to relocate the P6 truss to its permanent location during STS-120. All tasks were completed successfully. 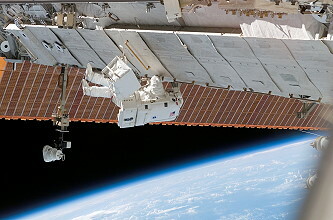 The fourth and unplanned spacewalk was performed by Patrick Forrester and Steven Swanson on June 17, 2007 (6h 29m) to activate the new solar array rotation mechanism SARJ and ready the lab complex for a critical sequence of upcoming construction flights; work included the removal of a keel pin and drag link from S3, the complete bolting down of a piece of debris shielding on the Destiny laboratory, the installation of a computer network cable on Unity, and the removal of a Global Positioning System antenna. Steven Swanson and Patrick Forrester retrieved a TV camera and its support structure from a stowage platform attached to the Quest Airlock and installed it on the S3 truss. They then verified the Drive Lock Assembly (DLA) 2 configuration and removed the last six SARJ launch restraints. The two astronauts cleared the path on the S3 truss for the Mobile Base System by removing temporary rail stops and hardware that had secured the S3/S4 truss segments in the shuttle's payload bay. The work completed the major tasks assigned for the STS-117 mission. The pair then began some of the get-ahead tasks mission managers had hoped to complete. The two spacewalkers installed a computer network cable on the Unity node that was to permit astronauts in the U.S. segment of the station to command systems in the Russian segment and opened the Hydrogen vent valve on the Destiny laboratory installed by Mission Specialist James Reilly during EVA 3. Steven Swanson and Patrick Forrester also attempted to bolt down two debris shield panels that could not be put back in place during an earlier spacewalk. Since the two were also not able to get it anchored, they tethered the panels on the space station's service module. Overnight, ground controllers planned to test the SARJ, ordering a small 5-degree rotation just to verify normal operations. Throughout flight day 10, the Russian central computer and terminal computers continued in stable operation. The astronauts hauled the last bits of cargo between the shuttle and the space station while flight controllers on Earth tested the station's resuscitated Russian control and navigation computers after they crashed last week. In the morning the shuttle maneuvered the Atlantis/ISS complex into position for a water and waste water dump and after it maneuvered back, attitude control was switched to and from Russian command successfully. At undocking time, the hooks and latches were opened, and springs pushed the shuttle away from the station. 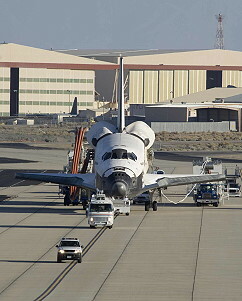 Atlantis' steering jets were shut off to avoid any inadvertent firings during the initial separation. Once Atlantis was about two feet (61 centimeters) from the station and the docking devices were clear of one another, Lee Archambault turned the steering jets back on and manually controlled Atlantis within a tight corridor as the shuttle separated from the station. Atlantis moved to a distance of about 450 feet (137.2 meters), where Lee Archambault began to fly around the station in its new configuration. Once Atlantis completed 1.5 revolutions of the complex, Lee Archambault fired Atlantis' jets to leave the area. 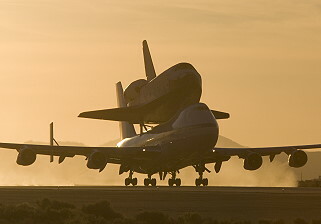 The shuttle moved about 46 miles (74 km) from the station and remained there while ground teams analyzed data from the late inspection of the shuttle's heat shield. The distance was close enough to allow the shuttle to return to the station in the unlikely event that the heat shield is damaged, preventing the shuttle's re-entry. During the separation from the station, a camera in the cargo of Atlantis bay observed numerous objects what could have been harmless pieces of ice and one much larger, more distinct piece of debris slowly floating away. It was not clear whether the objects originated from the shuttle or the space station. Around 21:30 UTC, Commander Frederick Sturckow reported yet another piece of debris leaving the area of Atlantis. Frederick Sturckow identified them to the mission control in Houston as "little phenolic-looking, kind of tan-looking washers with four slots" that are used to tie down the Multi-Layer Insulation blankets in the payload bay. The landing was running a day late because of blustery Florida weather. 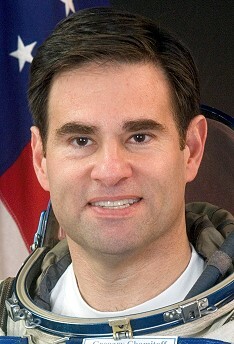 Clayton Anderson landed on November 07, 2007 at 18:01:16 UTC with STS-120.